The smell of Grape Fruit is one of the best, you cannot deny it, no matter if you like to eat it or not. When this very smell is added to your beauty product, how yummy it will be can you imagine? 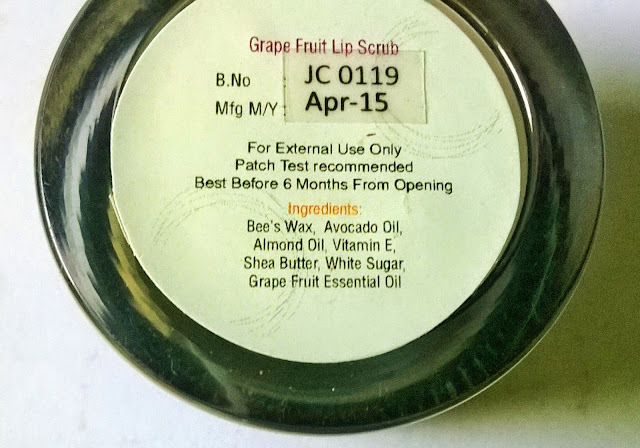 Well I will share how, as I review the Juicy Chemistry Grape Fruit Lip Scrub today on my blog. 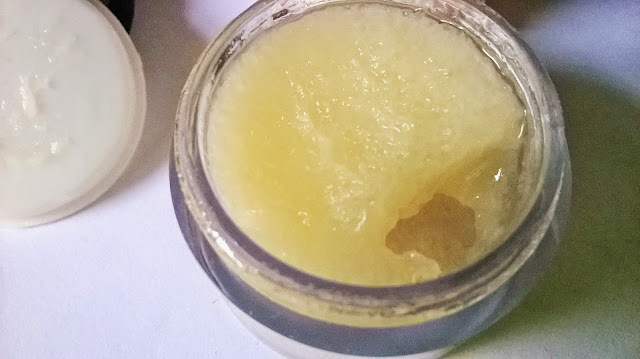 The lip scrub gently exfoliates, removing dead skin and revealing most nourished skin. My Experience: Do you remember the delicious smell of the fruit cakes we used to take for tiffin, when in school? 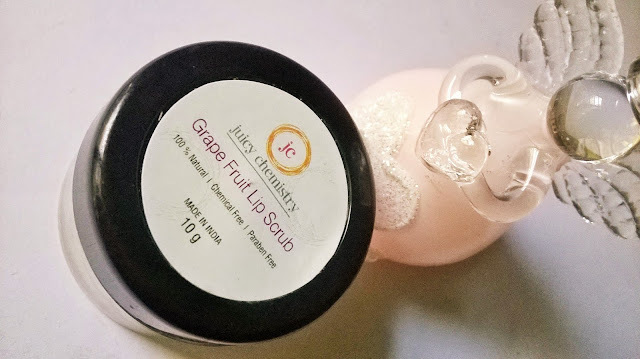 Juicy Chemistry Grape Fruit Lip Scrub reminds me of that smell. It is so yummy, that you feel like licking the whole thing. The packaging is very nice. The inner lid hold back the product from spilling or, getting messy around the mouth.This is the 3rd lip scrub I am using from any brand. So, I have a fair idea on how effective lip scrubbing can be. I like the fact that the beads are very fine and gentle to the lips. Very efficiently they remove the dry dead skin while caressing the lips with the tender fruity touch. 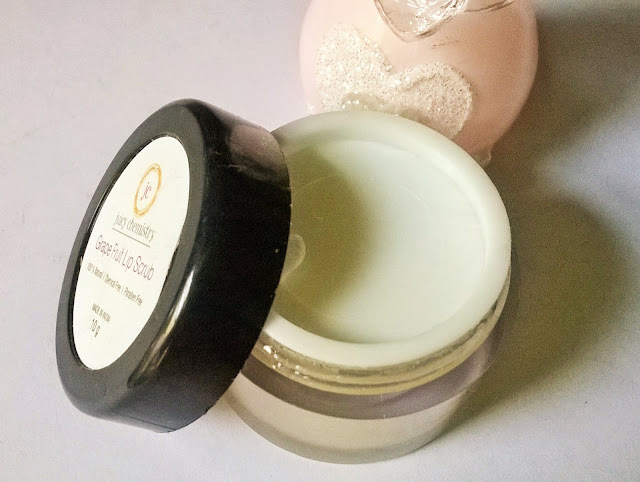 You just need to gently exfoliate for sometime, without being too aggressive, and you are left with soft, luscious lips that smell so yum. I have been using the Juicy Chemistry Grape Fruit Lip Scrub for a few weeks now, twice a week, as advised. 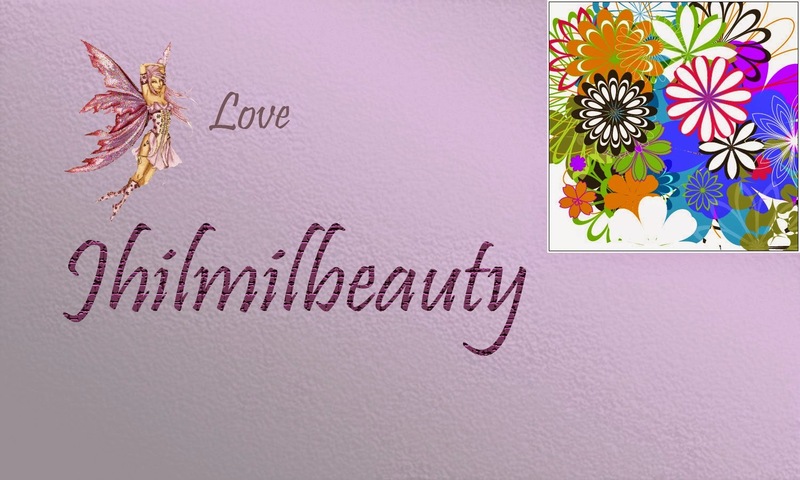 It is a brilliant product with all natural ingredients and superb results. 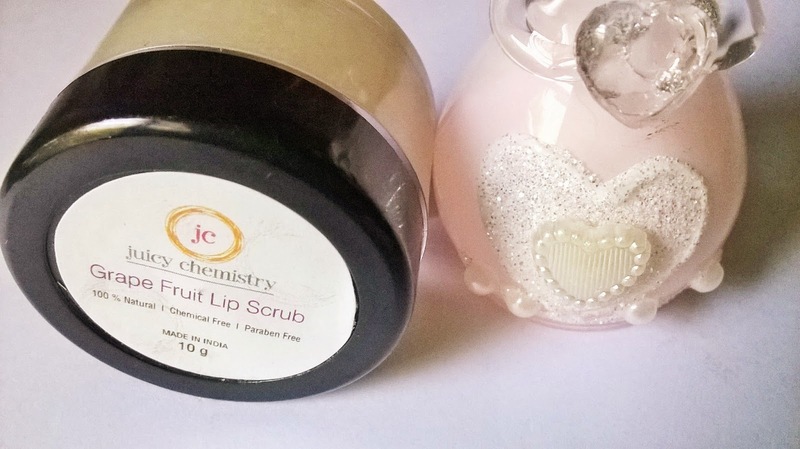 My lips are prone to getting chapped, but after using this lip scrub the condition has really improved. As any woman I like products that give instant results, but expect long-lasting improvements with regular use. Juicy Chemistry Grape Fruit Lip Scrub is a product you have to use for a period of time, to get to know its real effect. Like any part of the body, our lips are also prone to get darkened by sun exposure. 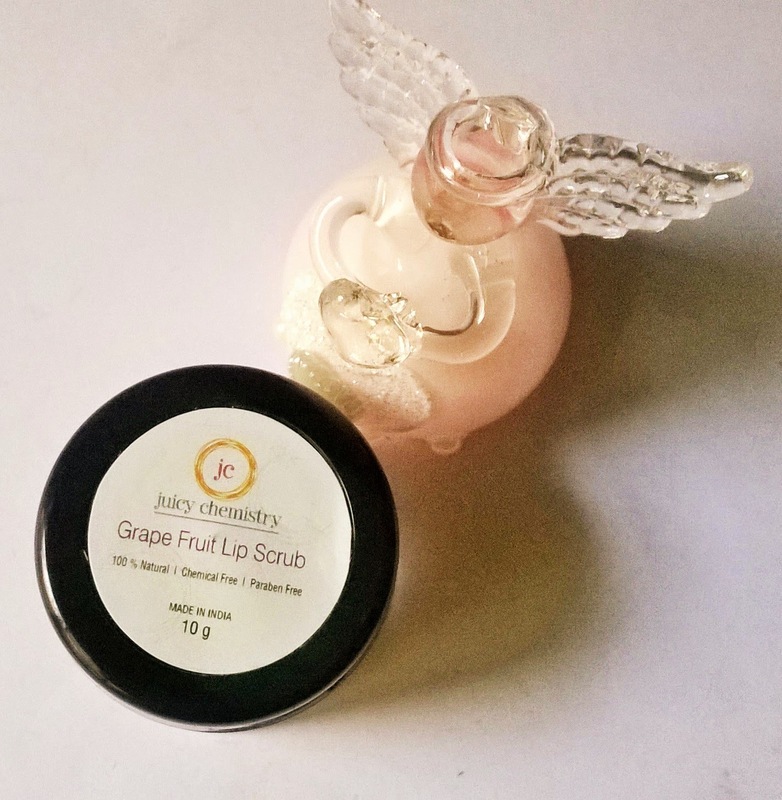 So, for pigmented lips like mine, regular use of lip scrubs like Juicy Chemistry Grape Fruit Lip Scrub can actually show prominent results. 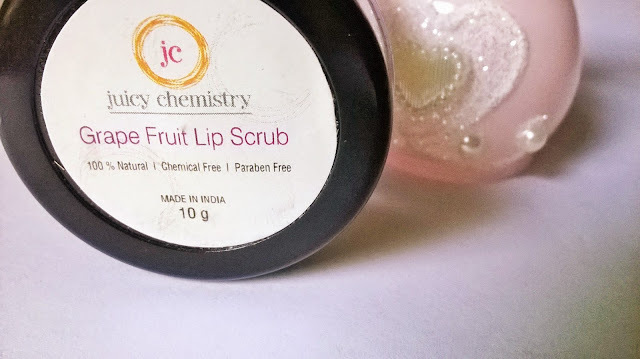 Juicy Chemistry Grape Fruit Lip Scrub is the best lip scrub I have used till date. 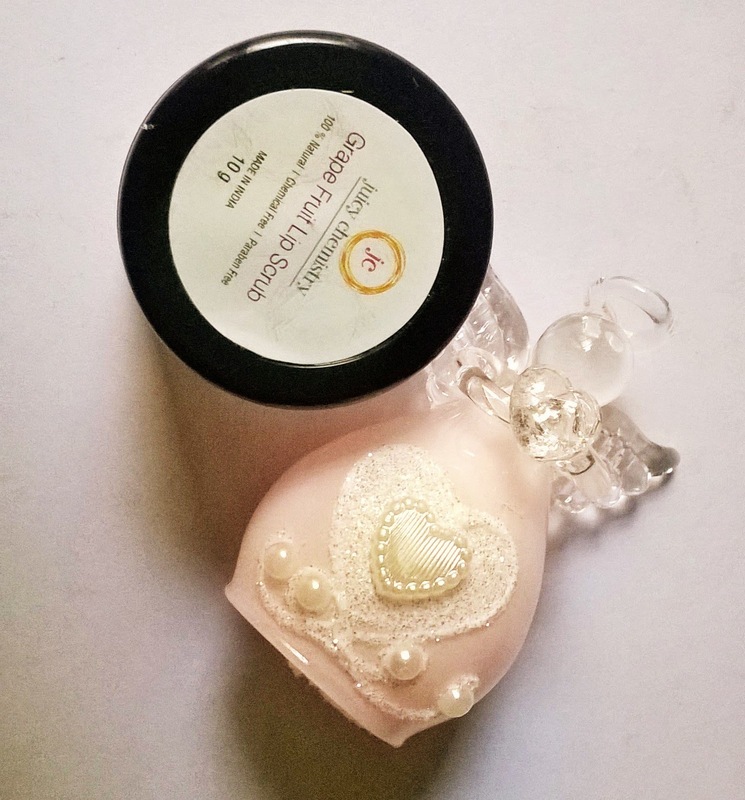 Starting from its ingredient list, to the excellent result and invigorating performance, it shows its brilliance all throughout and leaves your pouts luscious and kissable. A strong recommendation.